With summer in full swing we couldn’t be more excited to publish the 2015 MasterBash event details. Join us for MasterBash at Norris Lake on August 7th and 8th, 2015! Not sure what to expect? Check out these pictures from MasterBash 2014. In order to properly plan for the event registration is required. You must register online by Monday, August 3rd at 10:00am (you WILL NOT be able to register at the lake). You can register at masterbash2015.eventbrite.com. Extra Poker Run cards can be purchased for $15 to increase your odds of winning big prizes. Please note that we allow one extra poker run card per person. To register for MasterBash, please visit masterbash2015.eventbrite.com. 11:00am-5:30pm Floatilla! – Come tie up with everyone for a big raft-up at the MC Houseboat across from Deerfield. We will be back in the cove marked on the map. We’ll have music on lock, games and prizes for those that hang with us all day long! 6:30pm Dinner Time! – Join us for dinner at Sequoyah Marina. We will provide dinner and non-alcoholic beverages for those with dinner tickets. 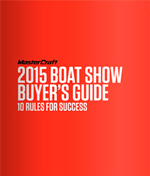 This is your opportunity to see the new 2015 MasterCrafts on the water! We’ll have a 2015 NXT, X25, X30, X46, and the all-new X20 in the water from 1:00pm to 6:00pm. Bring the kids, a board and invite neighbors! You won’t find a better opportunity to experience the difference of a MasterCraft before the weather breaks. Friday January 17th marks the beginning of the 2014 Cincinnati Boat Show. This is a great way to get the family out of the house and check out all the new stuff MasterCraft has to offer for 2014. We will have a new 2014 X-STAR, X-46, X-30, X-25 and ProStar on display. With the addition of the X-46, ProStar, GEN2 Surf System and 5-year MasterCare warranty there is plenty to be excited about. In addition to showcasing the new changes for the 2014 product line we will be hosting a customer appreciation after-party on Saturday night, January 18th, at the Mainstay Rock Bar from 9:30pm – 12:00am. The after-party is a short walk across the street from the convention center and a great chance to hang out with other watersports enthusiasts in a relaxed atmosphere. So grab your boating buddies and come help us celebrate a great 2013 as we start the countdown until summer. Cincinnati MasterCraft will host it’s annual Fall Customer Appreciation event on September 17th, 2009 at 6:00pm at Wake Nation! Cincinnati MasterCraft will be showcasing wakeboarding at its finest during the 2009 Great Miami River Days. In conjunction with Wake Nation, Cincinnati MasterCraft will have a group of local wakeboard talent perform demonstration runs on the river on both Saturday, September 12th and Sunday, September 13th. Come out to the festival and get a chance to watch some local rippers go BIG! Cincinnati MasterCraft is giving away free tickets to this incredible event! Come by the shop and get a free pair of tickets! Don’t miss your change to see the top professional riders go head-to-head! Come out and support the tour on Saturday, June 27 – 28, 2009 at Volunteer Landing! The fourth stop of the King of Wake series is the third stop of the MasterCraft Pro Wakeboard. The Pro Tour is a five-stop series within the King of Wake that features the world’s top pro wakeboarders. The third Tour stop will take place in Knoxville, Tenn., June 27-28 at Volunteer Landing. The two-day event will feature the world’s top pro riders competing cash, points and pride. Cincinnati MasterCraft will be onsite for this incredible event! Don’t miss your chance to see the top professional riders go head-to-head! Come out and support the tour on Saturday, July 18 – 19, 2009 at Freeman Lake in Elizabethtown, KY! The sixth stop of the King of Wake series is the fourth stop of the MasterCraft Pro Wakeboard. The Pro Tour is a five-stop series within the King of Wake that features the world’s top pro wakeboarders. The fourth Tour stop will take place in Louisville, Ky., July 18-19 at Freeman Lake Park. The two-day event will feature the world’s top pro riders competing cash, points and pride. Cincinnati MasterCraft will be at the Cincinnati Boat Show from January 16th to January 25th, 2009. Be sure to stop by and check out the 40th Anniversary Edition X-Star, X-30, and X-14!